Ballpark Basics: An older ballpark that doesn’t look the part. 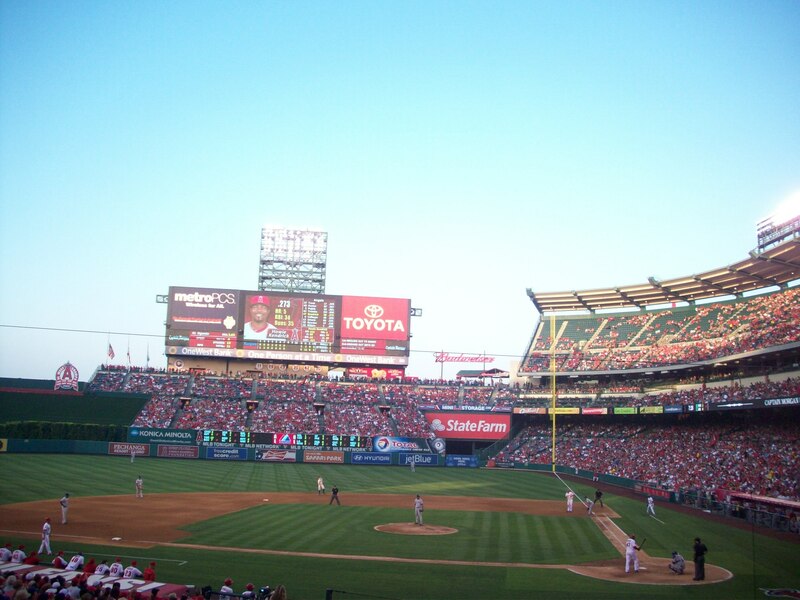 Ballpark Breakdown: Come around a bend while driving down the Orange Freeway, and you will suddenly be confronted by a huge (230 foot high) bright red A. 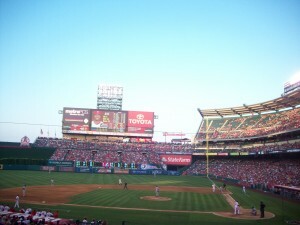 What was once the scoreboard for the Angels, now serves as a landmark, electronic billboard, and has provided the nickname for this park as well – “The Big A”. 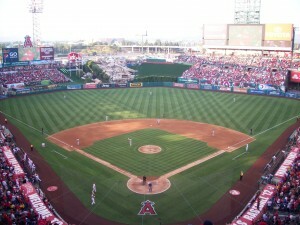 While the other Los Angeles ballpark is decidedly “LA”, the Angels Stadium is definitely in “Anaheim”. 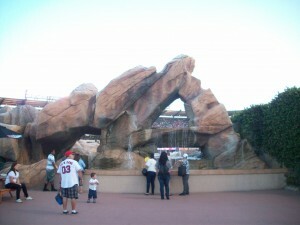 Situated right off the interstate and right down the street from Disneyland this ballpark has a much more suburban feel. Driving to the stadium you could confuse it for just another large shopping mall or office park. It actually shares a parking lot with a large movie theater and you could almost get lost in the huge parking lots surrounding the stadium. 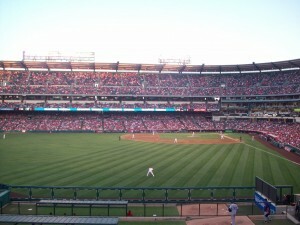 Angel Stadium of Anaheim has seen many incarnations, and at one point was even the joint home of the Angels and the NFL’s Los Angeles Rams (until the Rams moved to St. Louis in 1994). Opened in 1966, it is also the fourth oldest ballpark in the majors, behind Fenway, Wrigley and Dodger Stadium; but you would never know it. Having gone through over $100 million in renovations since 1993, the Angels have done a great job modernizing the ballpark and returning it to a baseball-only facility. We were there for an ESPN Sunday Night game which gave it the awkward start time of 5:15, and happily had been given a heads up on where to sit. The setting sun was brutal for the people sitting in the right field bleachers and down along the first base side and it didn’t let up until almost the ninth inning. Having also been warned about the limited craft beer options at the Big A, we kept an eye out for a spot to grab something local. The best (and possibly only) place to find craft beer is at the Draft Pick bar on the field level along the third base side. 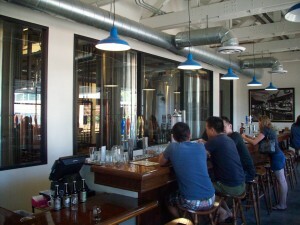 Here you will find beers from Bootlegger (2 options), Hangar 24, Fat Tire, Kona. Throughout the rest of the stadium you will have trouble finding anything else local; and apparently this is not by accident. 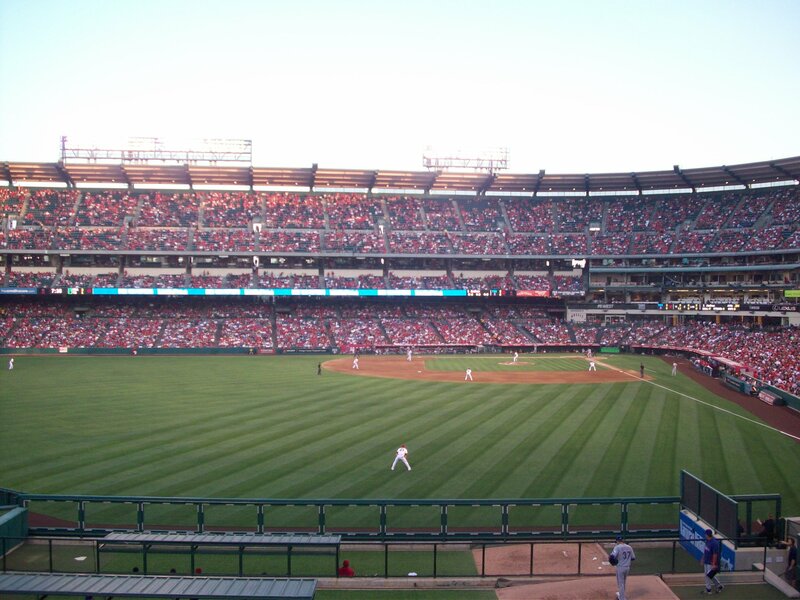 A number of the local breweries teamed up for a meeting with with the Angels to try and get their beers inside the stadium, but the team’s management was not interested. Even without knowing that piece of information, it’s easy to tell the Angels are in bed with big beer. Multiple areas dedicated to the major distributors are laced throughout the park, including the “Bud Light Patio” in right field which is right next to the “Coors Light Cold Zone” in center field. With every square inch of each space plastered with the Bud or Coors logo both areas look like are decorated to the hilt with ads for the beer (or beer company) in question. Side note: There are a ton of places to get your liquor fix with multiple areas to get assorted liquor drinks, more than in any other ballpark we have visited. There are a few signs that will let you know that you are on the west coast for a ball game. First and foremost is the crowd. As we mentioned earlier were there for an important Sunday night game between the Angels and their division rival that they were chasing in the standings, the Texas Rangers. However, the crowd was very relaxed and didn’t appear to be that into the game (granted it was July so there was still a lot of baseball left to the season, but still). There were also beach balls floating throughout the crowd as the game went on. The next thing that clued us in was the food options. 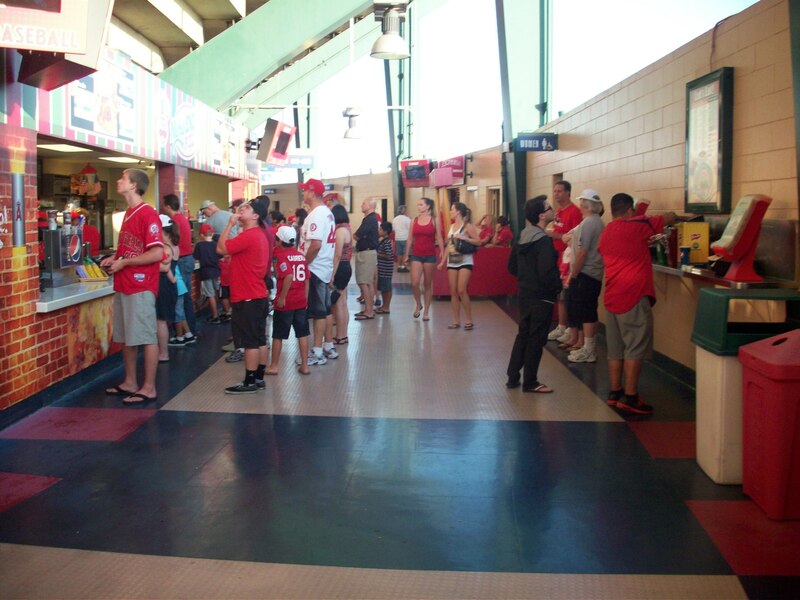 On top of your typical ballpark fare you can also find healthier options such as veggie dogs and hummus platters. The top concourse is really the only place in the Big-A where you can tell you are in an old ballpark. They have redone the area, but they didn’t seem to have a way to expand the concourse on that level, so the walkway is much more narrow than we are used to in more modern parks. There is still sufficient room to move around, but it does not give you a view of the action, and can be difficult to navigate as it tends to get quite crowded between innings. The main concourse is behind the grandstand on the field level but you can watch the game as you walk around the 2nd level (Field Terrace level). This will take you to the outfield deck which has one of the most unique views in all of baseball. 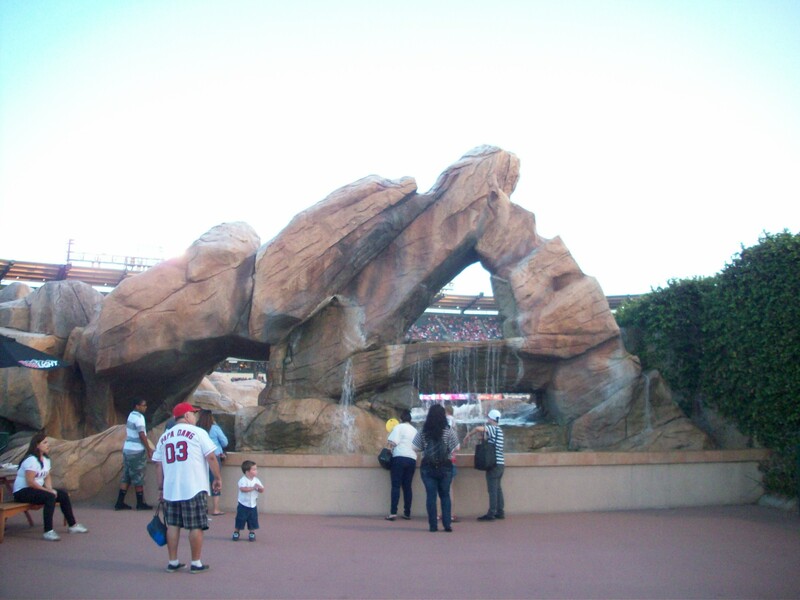 Here you can watch the game over large rocks with waterfalls known as the “California Spectacular”. Since this installation appeared at the park many a (less than sober?) fan has deemed it smart to climb out on the rocks. Don’t – unless you’re looking for a one way ticket out of the park. From the statue of the original owner, Gene Autry, on the third base side to the nod to the Disney years (Walt himself sat on the board until 1966, and the Disney corporation controlled the park from 95-2000 and even produced Angles in the Outfield to help build the fan base) with a statue of Mickey in center field they have done a great job of incorporating important people and moments from the team’s history all around the stadium. There are also pictures of former Angel greats and their accomplishments throughout the concourses including the World Series trophy from their 2002 championship right outside the Diamond Club Lounge behind home plate. All in all, as you sit in your seat to watch a game you would have no idea that you are sitting in a 46 year old stadium. While walking around there are some tell-tale sounds that show the age of this place. However, when it comes to the view from the seats with the San Gabriel Mountains in the background on a gorgeous Southern California night you really can’t complain. 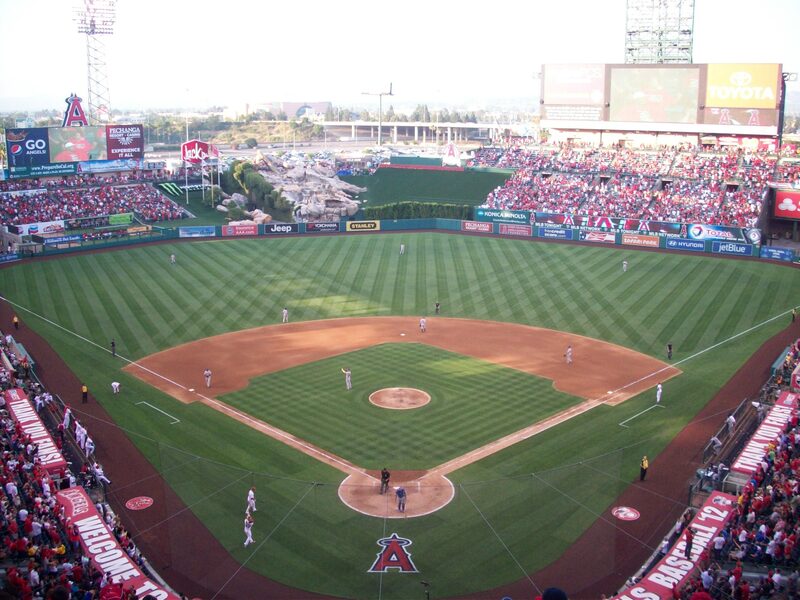 Baseball Nerd Fact #30: Nolan Ryan threw four of his seven no hitters in Angel Stadium. Brew Basics: A new spot with a long history, and a rosy future. Our thanks to the employees of Anaheim who were welcoming, friendly, and allowed us to write down pretty much anything and everything they said…and then gave us carte blanche to use it. We went into this one with some seriously preconceived notions. 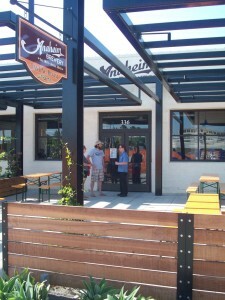 Jim thought we were walking into something strip mall generic, a “brewery” in suburbia whose real focus is Friday night. Gillian thought this was going to be a small time operation, something with one, maybe two people behind it, a 25 gallon barrel or less set up. Not sure where the impressions came from, as they were very different from either other…and from reality. The obviously named “Anaheim Brewery” actually derives its origins from a twisting history, that is complicated to explain but here are the Cliffs Notes ™ – Two specific breweries (California and Anaheim respectively) pertain to our story, both dating back to the 1800s. When the original Anaheim closed, one of the founding members of California Brewing adopted the name and opened up shop elsewhere. He ran it from 1888 to 1904, when it was sold to another family who kept it in operation until the advent of prohibition. Fast forward 80 or so years…..
Greg and Barbara Gerovac, two entrepreneurs with brewing experience on the east coast have moved to Anaheim and are looking to go into business for themselves. A bit of reading, a bunch of research and a few visits to the original founders graves later (really! 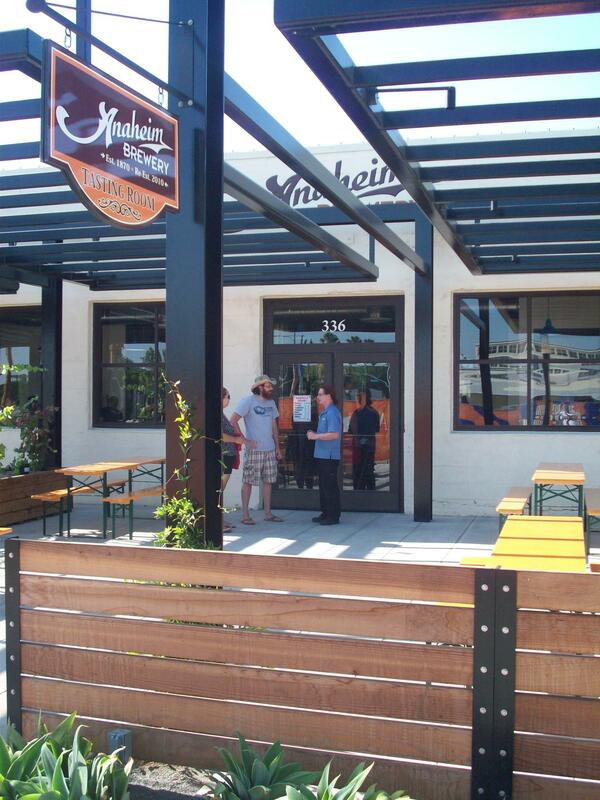 They even left him a beer) Anaheim Brewery reopens with an asterisk on the sign reading “est. 1888 re-established 2010”. Even their service is old fashioned, which in this case means, very hands on. 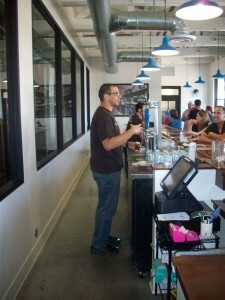 Despite the fact that Greg and Barbara are in charge of every aspect of this company, from brewing to driving the delivery trucks, they were out in the tasting room, right in the thick of things, bussing glasses, having one of their own, and sharing war stories with the regulars who had stopped in for a sip or two before the Angels game. The Gerovac’s do have a bit of help in the tasting room. The staff maintain an active, friendly, and watchful eye over their domain. The back of their shirts say “flight attendant” which is apt since each of the six offerings in the flight are poured one at a time, and served with a story, palate and nose descriptions and even suggested food pairings (although the only food at Anaheim is the burger joint next door). Although this is still a small company, they have 6 brite tanks, three more fermenters on order to help fill them, and room to expand. In the six months they were up and running in 2011, they produced 200 barrels and have increased the pace a bit, already having generated 250 in the first half of this year. While not available at Angel Stadium (see the review above to find out why) you can find them in many restaurants, stores, and even Disneyland. See parents? There is good karma for braving those amusement park lines! Below are the ones we got to try. The first four are their standard year ‘rounders, the last ones are seasonals that rotate through, but barring any unforeseen issues, Anaheim should always have two of these available for you as well. As mentioned, the “flight attendants” have quite a spiel down for each of the beers they pour. If you take the time to listen, you will most likely learn some interesting things. And once we heard a beer described as “smelling like Sugar Smax” we quickly realized we would have to impart some of this wisdom onto you. To that end, anything in the descriptions below that appears in quotations can be attributed to Kellen the Bartender, who probably has quite a future ahead of himself as a talkshow host. Anaheim Gold – Orangey golden color that smells sweeter than it tastes. This lager has a surprising amount of body for such a light beer, malty with a hint of natural sweetness. This would be good paired with white fish or summer salads, and is the one that reminds Kellen of Smax. Anaheim Hefeweizen – Another lightly hued beer without any of the orange-brown notes you sometimes find in a hefe. This aroma was best described as “starting out like banana Runts, and then changing to more like banana Now And Laters”. A surprisingly apt description. In reality, the clove smell comes through in the aroma, but the palate is strongly – almost overly – banana. From our experiences, we seemed to find that those who like traditional hefeweizens weren’t too ecstatic about this one, but those who typically don’t enjoy this style appreciated it much more. Good to pair with a stronger fish, like salmon. Anaheim Red – The bouquet on this one comes off caramelly with molasses notes. These ingredients blend well in the flavor, and combine with strong malts to create a consistent, strongly malted beer with just enough sweet. 1888 – The Anaheim workers like to say “there is a difference between being hoppy, and being well-hopped”. This beer, the flagship of Anaheim is –needless to say –the latter. A pretty sienna/mahogany beer that is just a bit hazy, it comes highly carbonated. The flavor is drier, smooth, and without the caramel flavors of the others. It comes from a recipe based on beer served in the original brewery, which means it isn’t as complex as some of the craft beers we are used to today, but it still a straight-forward, solid beer. Pair with spicy meats, like sausage. Anaheim Pilsner – Lots of head that evaporates quickly, and the beer is almost the same color as the bar itself. It’s a Czech style pils that starts light, and activates the “briney” sides of your tongue to create that briefly sour sting which builds and is actually fairly strong by the end of the sip. Overall, this pilsner has mainly earthen tones, with prominent wheaty malts and a hop finish. Anaheim Oatmeal Stout – Here we were told that stouts go through three phases of flavor during the brewing process. At 300 degrees, it tastes like coffee, at 400° it is more chocolately, and once it hits 415°, it goes back to coffee, which is how you know it’s done. This stout in particular is thin but with good flavor, and a dark chocolate color with pretty ruby tints. The aroma is rich and mostly malted, but the swallow hits different parts of your tongue, and along with barley and oats it is even a bit “pretzel salty” alongside the coffee, which is prominent throughout.